Episode 7 of The Inland Sea i playing now. If Rudolph were here, he would have been eaten by now. Alien spacecrafts! Abductions! Government conspiracies! Yes please, and a powered camp site for the night, thank you! New image gallery from The Inland Sea: En route from Aldinga Beach to Coober Pedy, venturing into the outback. 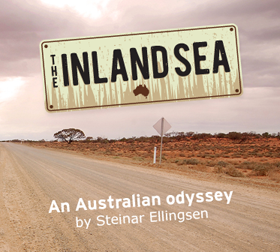 This piece about The Inland Sea by Eigil Kittang Ramstad appeared in Laagendalsposten on January 10, 2009 – while we were traveling. Click this link to see the .pdf.